Before I get into my post - big birthday shoutout to DAVE!!!! The kids and I excited to celebrate him today and attempt to spoil him a bit. Dave isn't one for gifts and attention and we're planning lots of both. ;) He is THE BEST and we can't wait to show him how much we love and appreciate him. That's a yeti of iced tea from home, a Starbucks and then another iced tea from later in the day. You do what you have to do during inservice. ;) In actuality, the speakers on Friday were fantastic. I learned a lot, had some great time with my team and left with lots of notes of things I want to work on and incorporate into my classroom. Throw in a chocolate chip cookie and I'd call the day a win. We spent the rest of the evening swimming, watching the opening ceremonies of the Olympics and checking out an amazing moon. They made these skateboard/pencil holder things and had a blast. So I've talked about Mission Regan before, but in case you missed it - it's a non-profit started by friends of ours that collects and sends medical supplies all over the world. Josh and Courtney are INCREDIBLE it's so neat to get to see God working so uniquely through them. Our kids have helped out at the warehouse before and I've taken several groups of MCA students there to help as well. When Courtney told me about her idea of having kids and families host lemonade stands to raise money I instantly loved it! Don't all kids want to have a lemonade stand?!?! And doing it for such a great cause was the icing on the cake. Mason wanted me to write out his poster in pencil and then he went over the whole thing in permanent marker and colored. I wrote out Griffin's poster and Luke worked on his solo. Mason stirred up the lemonade that evening and we were ready to go! We decided to have our lemonade stand Sunday night from 7-8 pm in the hopes that it wouldn't be as crazy hot... well... it was still like 95 degrees and felt well over 100... even in the shade. I feel like it should be noted that my kids all look like they're about to explode in these pictures because they take after me and turn red almost instantly :) Also, they ran around for over an hour in that heat. So there's that. Mason and his sign! Those are ice cubes on every other one of his letters and he wrote Mason (backwards and without the N) on the bottom left. His hand got tired and I had to do the ice cubes on two of the letters but he was SO PROUD of his artwork! He also added on this little bit about him taking tips in the form of money and crystals :) WHAT?!?! hahahaha He cracks us up!!! Ready for our friends!!! Look at their red cheeks and we haven't even started!!! And we ended up letting Jack Bauer out after the girls BEGGED. Pretty sure it was the greatest day of Jack's life :) He LOVES kids and attention... he was in HEAVEN! Luke's first grade teacher even stopped by!!! We ADORE Mrs. McKeller for lots of reasons - but I think this right here sums it up :) She is THE BEST!!! Mitchell, McKinley and Anna Grace! I can't even begin to tell y'all how special it is that we have teenagers in our lives who love on my kids. There is nothing like it! My kids adore them!!! And look at these sweet faces!!! Poor kitty had a good time. I'm not sure who started it, but somehow we ended up with an ice/lemonade fight on our hands and I'm pretty sure my kids lives were MADE! Ice fight with big kids?!?! Amazing. After everyone left we jumped in the pool and then it was showers all around. This was such a cool experience for our kids. Mission Regan just took a group to Zambia and we were able to look at the pictures, pray for the people they were treating and talk about how blessed we are to have access to everything (and more!) than we could possibly need and how important it is to share those blessings with others. 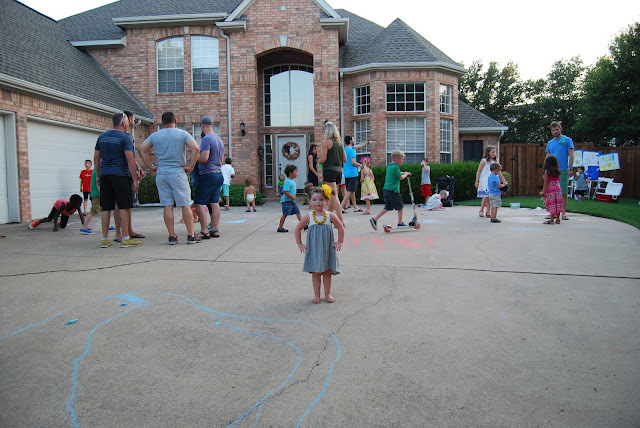 I want my kids to have hearts for serving others and generous spirits willing to give freely and joyfully and I felt like this was a project that fit that bill completely. I think I was in the 4th or 5th grade when a mom at the church I attended was diagnosed with breast cancer. I remember vividly wanting to "do" something and so my friend Kelly Beth and I organized a whole carnival at our church for her. We worked our little tails off.... planning booths, visiting dozens of restaurants asking for their extra happy meal toys for prizes, organizing games, etc... and we were able to donate a sizable chunk of money to her family. I remember being so proud of what we (just KIDS!) had accomplished on our own and tackling other service projects growing up because of this experience. It's a memory that left a lasting impression with me and I hope to foster many of those types of memories for our kids. 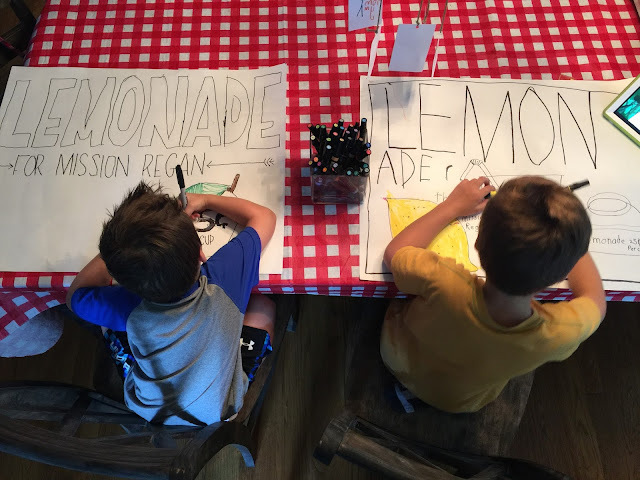 If you're interested in hosting your own lemonade stand you can get all the information HERE. I love that you are teaching your kids about working for money and then donating it to a cause bigger than themselves! Such wonderful lessons to learn at such young ages. Love this! Wow!! $210+ is awesome! Mary Lucas spoke at my office a few years ago (we are in KS where she is from). It was a great talk! I still have her bookmark that lists all the lunchmeat lessons! I hope you enjoyed her as much as we did. Your kids are so adorable!! Love their lemonade stand. Thank you for sharing how you instill in them a desire to help others. Can you please do a classroom decor / organization / setup post? I'm heading back to teaching after maternity leave and I'm in major need of inspiration! Lol! This was such a great post! I'm so sorry we missed it! Make sure you save a glass for me for sure. And the whole red faced thing is TOTALLY ME. People are always asking if I'm okay! Ha! We did the Home Depot workshop Saturday too - and I guided my two how to build it...upside down!! Oops! Also, my daughter has the same dress Griffin is wearing at the lemonade stand and I LOVE it!! So glad the stand was a success!! LOVE! Serving with our kids has always been something we've tried to do and now (at 21 & 17) they love serving others. Keep up the good work mama. You're raising great kids! I hate that we missed the lemonade stand! I'm so happy you guys did that for Mission Regan! What a great and FUN service event for your kids to be involved in at such young ages. I think sometimes we can forget that serving others can be so rewarding for everyone involved. Cute people!!!! We had a blast last night! Can't wait to host our own lemonade stand for Mission Regan! Love love love this post, the stand, these pics, and the McAnallys!!!!!!!!! Thanks sweet friend! I work at a non-profit in Pittsburgh called Beverly's Birthdays. We provide birthday parties, presents, and experiences for homeless children and families in-need in the area. One of the biggest blessings this job and organization has provided for me is witnessing KIDS serving KIDS. All of this to say that I am so, so grateful for parents like you who instill service in their children's lives from the very beginning. You are leaving a lasting impact and a legacy that they'll surely carry with them through their lives and continue to build on and pay forward. Thanks for this sweet post, Andrea! I am so happy to see what a success this event was for such an awesome organization. Love your lemonade stand! We did this for the first time in July to raise money for a friends memorial fund and my daughter loved it. You know what's awesome? Is that ALL of those kiddos are red-faced, sweaty, messy - and loving it! My favorite thing at the end of the day is giving the kids a bath or shower because you know that they've played hard and had fun. My kiddos are a sweaty mess at the end of the day, and it's fantastic that they exercised, played, and were creative. Isn't that the best part of being a kid?! Kuddos to your kids for the lemonade stand, too. A kind, giving heart is the best thing to model for our children. I love that you guys are teaching your kids about charitable causes at such a young age. Ya'll are such amazing parents! And $210?! That's incredible!! How fun! My youngest and three of his buddies hosted a lemonade stand at our church one Wednesday this summer with proceeds going to our church's debt retirement campaign. It was a blast. I love Griffin's pink & white striped top/dress! Such a cute girl!! Teaching our kids the blessing of serving others and having a blast while doing it...so good! Happy Birthday to Dave, y'all make such a great couple:).